What does Britain’s Science Media Centre (SMC) think of social media for science communication? Most people working with science communication will probably have heard about Britain’s Science Media Centre (SMC) and perhaps also about its front woman Fiona Fox. In case you’ve never heard of it or can’t really remember what it is about the scientific journal ‘Nature’ recently published a news feature on SMC and Fiona Fox which gives a good overview of the centre, its concept and the critic it faces. scientists, engineers and other experts by supporting them in engaging with the media and by creating more opportunities for them to get their voices. Press officers by supporting them when they are working on complex science, health and environment stories. 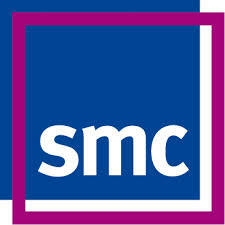 In addition, the SMC provides expert advice and evidence on issues relating to science in the media. I won’t repeat the background or work of SMC further on this blog but instead refer to the Nature article or their Science Media Centre website. Reading the Nature article with the interview with Fiona Fox and looking at SMC’s website it strikes me how reflections on the use of social media for science communication seems completely absent. It is not mentioned once in the article and on the website they link to their own Twitter account and Fiona Fox’s blog, but other than that there is no reference to social media as a tool or as medium for science communication. Even in their Top tips for media work to help scientists to work with the media social media is not mentioned with a word, despite the fact that social media provides an excellent opportunity for scientists to communicate their research. Neither is it mentioned in their 10 best practice guidelines for reporting science & health stories. Of course these two guidelines are meant to be a tool on how to prepare for meeting the scientist/journalist and interpret correctly what information they are looking for or sit with, but none the less social media is only growing in influence also among scientists, so advice on checking out if the researcher is blogging about his or her field or using other social media could be worth including. As could advice to scientists on using social media to communicate themselves and use this communication channel as a resource to guide journalists too. In the Nature article, Fiona Fox says that the part of her job in which she takes the most pride, is convincing once-timid scientists to join the SMC database and speak out. “A real triumph for us is getting a scientist who has worked for 30 years on a really controversial issue and has never spoken to the media,” she says. I wonder if she also encourages them to take communication into their own hands and start communicating through social media as well or if she mainly thinks of them talking to journalists who then do the communication or sign up on the SMC scientist roster….. All in all, I guess I’m quite unclear about what SMC and Fiona Fox thinks of social media for science communication. That social media plays a key role in emergency situations is evident. Lots of events have proven it’s efficiency and it’s multi-purpose qualities. However, this has definitely not been clear to everyone. Then a tragedy occurs in Boston and it becomes clearer and clearer that social media cannot be brushed aside. There are already lots of great blog posts, Twitter discussions etc. about the role social media played (and is still playing) in the events related to the Boston bombings, so I won’t try myself to replicate those. 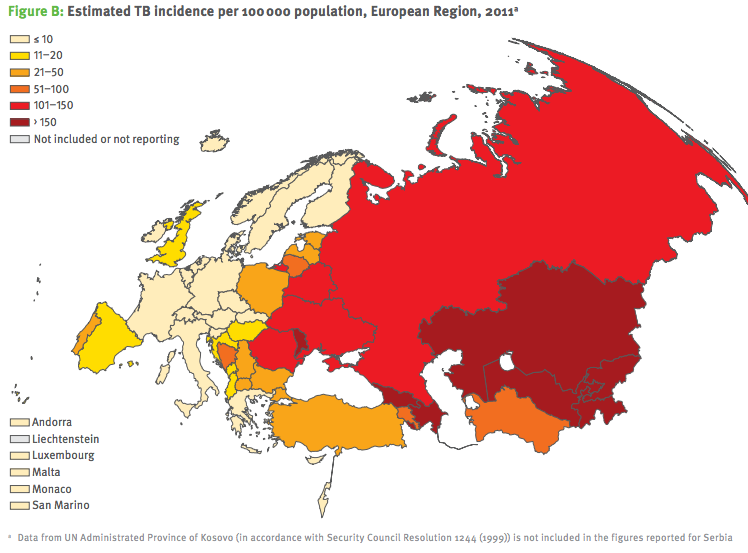 A post that gives a good overview and is written by a public health professional is Leah Roman’s blog post on the blog Pop Health. She goes through some of the key themes of social media in the emergency response, ranging from Immediate Public Safety Concerns and Instructions over Investigation, Reconnecting people, to the functioning of social media as a Resource for Journalists, and it’s role in Mental Health & Support Resources. 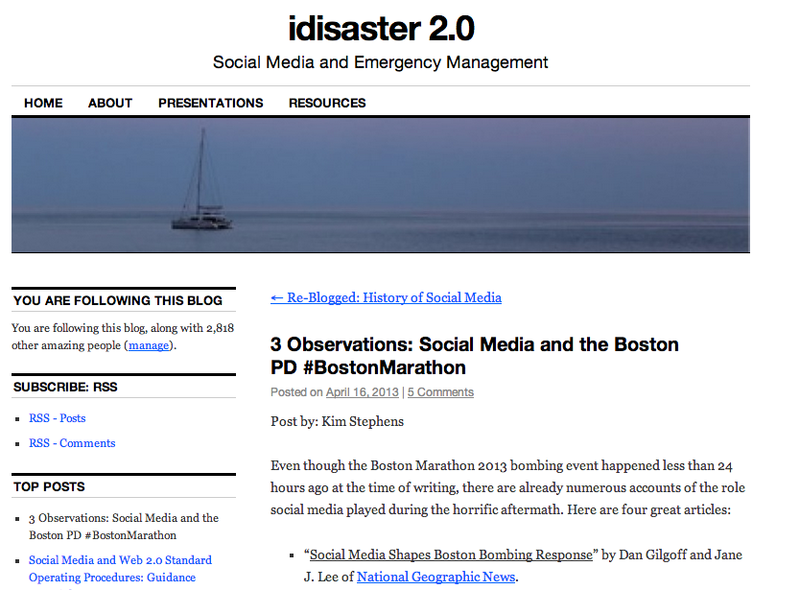 Another good post about the social media in the boston bombing is on the blog iDisaster 2.0 that shares links to other great articles about the role social media played during the horrific aftermath and presents three observation on use of social networks, particularly Twitter, by the Boston Police Department. Also worth a read. In the last couple of days, old media and new media are both reporting of how the later beat the first during the Boston events. Especially CNNs failure to keep up with social networks in being first with the news is being covered and discussed (among other places in this article in the NY Times and in Danish in this article in Politiken). The dynamic between the traditional media and new social media is interesting, and the relationship between the two will certainly continue to evolve. Without knowing the details of the discussion back in time when radio and later on TV came into being I’m sure that there were similar discussions on the then new media challenging the old ones. I look forward to seeing how it develops, and how emergency management manages to make use of what is still categorized as ‘new media’ and its relation with traditional media. When you sit in your own little world working on your things, it can be hard to assess how all the different loose ends relate to each other and whether there is any direction and overall frame for what you do. But then an external observer (in this case a journalist) comes along, interviews you for 45 minutes, based on which he picks 7 quotes and writes a short article. And Voila! All of the sudden it sounds like you are super focused, which you probably are, it’s just see hard to see for yourself. This is what happened to me recently. 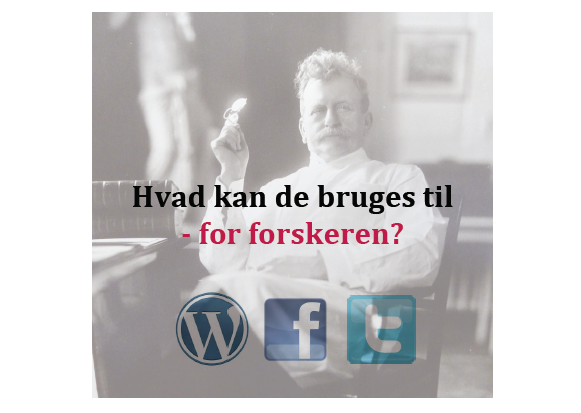 I agreed to act as a ‘case’ for a journalist writing an article about the opportunities in Denmark to get government support for taking additional education. When I chose to do a one-year degree in Journalism, I was so lucky to be approved for SVU (the State’s Adult Education Support) which meant a monthly allowance during my studies equal to 80% of unemployment support. 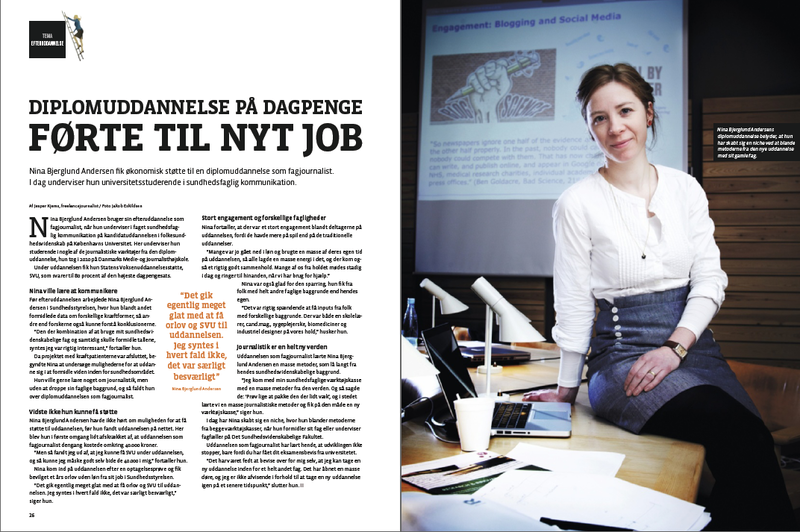 The article was published this week in the magazine of the The Association of Danish Lawyers and Economists (and lots of other academics, including people with degrees in Public Health Sciences). Its in Danish, which may prevent lots of my readers to read it, but none the less: below is the article (you can also read it on page 26-27 in DJØFbladet). “Today, Nina has created a niche for herself where she mixes the methodologies from both of her tool boxes [public health sciences and journalism & communication, edit], when she communicates in her field or teaches at the Faculty of Health [at University of Copenhagen]”. A field of Public Health Sciences and communication, or Public Health Science Communication. The sound of it feels right to me, and I guess its time to embrace and articulate the niche more to myself and in my introduction of myself to others. I guess it also shows that I wasn’t completely off, when I some time back chose the to name this blog Public Health Science Communication 2.0. How can communicating your research benefit you as a researcher? This was the theme of module 3 of the Public Health Science Communication Course and also a question raised on this blog in a previous post. To my surprise finding good literature on this topic was not easy, but thanks to the help of you readers (thank you for all your tips) and the students in the class we did manage to come up with a list of benefits which I’d like to share here. Some might disagree with them, but I guess it all depends on who you are as a researcher, what you’re conducting research in, and on where and how you’re doing it. Anyway, here’s the list, divided into benefits for the researcher and benefits for science. Please do add to the list or voice your disagreement in the comments section. What is in for the researcher/scientist? Cash! – The premises for doing most research is cash – at least if you want to make a living on it. Most grant proposals include a section asking how you plan to disseminate your findings. By living up to this (and by explaining what your research is about) you can make sure for example that a pay check comes your way every month, that you can go to that awesome conference in Hawaii, that you can get a new laptop and the latest version of SPSS. Personal satisfaction – Hairdressers like to be complimented for their talents with a pair of scissors. Students like to get good grades, actors like to get good reviews and have good ratings. Scientists are no different. Finding that a wide audience is interested in/bothers to learn/listen/read about your work can be energizing, especially if your work is usually only of interest to a few scientists. It can also help establish your name as an important expert or resource person in your particular field – which can also be personally satisfying. Career development – Communicating can impact positively on your career. It’s evidence of your work, skills and accomplishments! And it can help show that you have an understanding of the role of your research contribution plays in the context of society. Make your name known – The more you communicate the likelier it is that your name will become familiar to other scientists, including those in different fields of study, potentially helping with career advancement. It my also increase your chances of getting funding, as your name is known and funders can read some of your work (e.g. by Googling you). All of this is of course under the condition that what you are known for is your high quality research! Get to know your ‘enemies’ – your enemies or competitors may one day end up as your future partners in research. By communicating (which opposed to disseminating is an two-way process) you may get in closer contact with your colleagues, competing institutions, stakeholders etc. It gives you a feel for the movements and trends in the field or industry and it may provide good background knowledge for if you end up competing for the same position/funds etc. Networks! – Communicating makes your network grow. Networks are important when you’re looking for your next job, need recommendations, are crowd sourcing ideas, seek support (financially or academically), or help to spread your findings even further. Invitations to be part of a new or emerging research project is a potential outcome. Very often, these take the form of interinstitutional and/or interdisciplinary grant proposals. (Words like “interinstitutional” and “interdisciplinary” are increasingly popular with the folks who review grant proposals these days). Make your research meaningful to the world – communicating what you do can help you to see the relevance of what you do to society. When it boils down to it most of us like to feel that our time is meaningfully spent. Help shape your personal identity as a researcher – by communicating you are almost automatically provoked to reflect upon your work and your role as a scientist. Are you truly communicating (dialogue-based) and not just disseminating this benefit may be even stronger. It may also help you focus on what exactly is the core of your research. Become a better communicator – the more you communicate the better you get at it. It’s a simple as that. What is in for science? Feedback – Feedback is an essential component of almost every discipline, whether you’re learning to ice skate, write music or teach Spanish. If taken seriously and responded to this feedback may improve the outcome of your work. Research is no different. By communicating it, the world becomes aware of the project’s existence and can offer advice and inputs, share experiences and give suggestions for improving and validating the research. Cash – The premise for most research is money. Grant proposals often include a section asking how you plan to disseminate your findings. By living up to this (and by explaining what your research is about in the actual proposal) you can make sure that a) the project becomes reality, b) the necessary staff can be hired, c) the necessary IT/lab equipment is available, c) That your research funding may be followed up by a new round of funding. Crowd sourcing and validating – Several minds contribute better than just one. By communicating, asking questions, collecting experiences and information from your network research be improved with new incorporating new perspectives, ideas, confirmations etc. Getting inputs from the surroundings may also help qualify and validate the research and prepare it to potential critic. Increased impact – Communicating through different channels increases the likelihood of the research being found and used in real life. Contribute to a positive image of science – By communicating research, documenting the outcome of the investments in science and being transparent about how money is spent something is fed back to the contributors, which makes them feel that they got something out of their investment (of time or resources) and makes them feel investing in science is worth while. In addition, it can help to make clear how science contributes to society. All of this of course requires that the research done is of high quality and have followed good research practices. Transfer of knowledge – You may get a better job, you may go on maternity leave or realize that you always wanted to be a R&B singer. Having communicated what you did makes your contribution remain also after you have left and lets other learn from your experiences – in the end contributing to science.